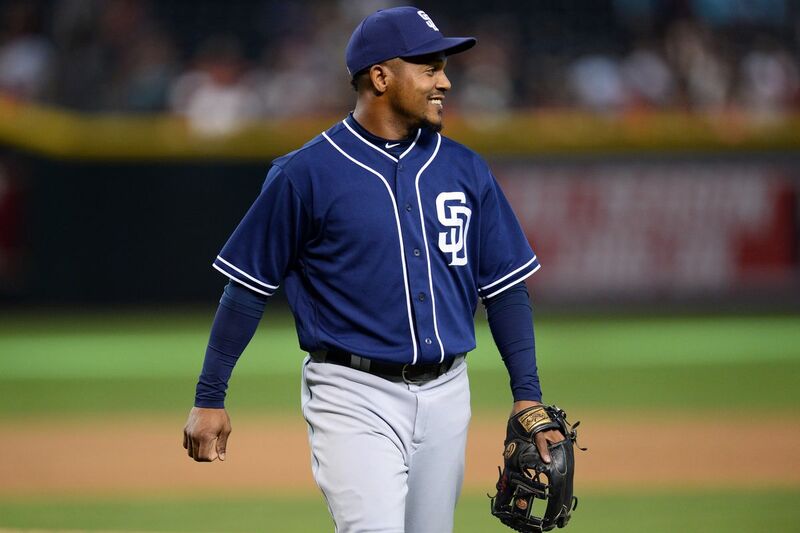 Aybar was yet just another veteran stop-gap shortstop for the Padres in 2017. The Padres signed him to a minor league deal in the offseason with an invite to spring training. Aybar earned himself the starting gig and a roster spot after playing much better than competition, Luis Sardinas, during spring training. Aybar produced a 0.2 WAR, slashing .234/.300/.648. He hit seven homers and stole 11 bases. Aybar did a decent job minimizing strikeouts and getting walks. He walked 28 times while striking out 57 times. Defensively, Aybar was above average in zone factor, but produced -4 defensive runs saved. He wasn’t awful at shortstop, and most days played pretty well there. He did his job and served as a one year stop-gap for the Padres in 2017. 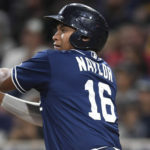 The Padres will likely need to sign a free agent to man the position over the next year or two, until highly touted shortstop Fernando Tatis Jr. is ready to take over the position. Hopefully he will be the answer to the Padres decade-long shortstop problem. Comparing Aybar’s production to other players at shortstops production, he is abysmal. He also is a 33-year-old veteran of the league in a steady decline. It would be unfair to grade Aybar based off of overall production without incorporating expectations from the veteran. He was an all-star compared to Alexei Ramirez, Clint Barmes, and Alexi Amarista. Aybar also was a strong veteran presence in the clubhouse and was a mentor to young developing SS/OF Allen Cordoba. With that being played into the equation, I think Aybar rightfully deserves a passing grade. 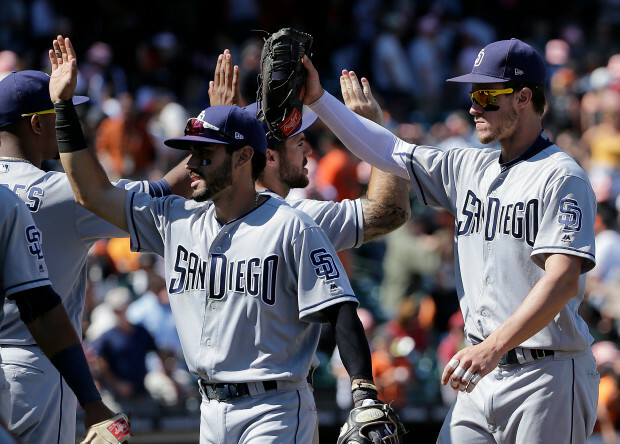 Spangenberg was pissed when he was left off the opening day 25-man roster this season. He responded by hitting .348, and getting on base at a .403 clip in Triple-A across 66 at-bats. His performance earned him a promotion early in the season. 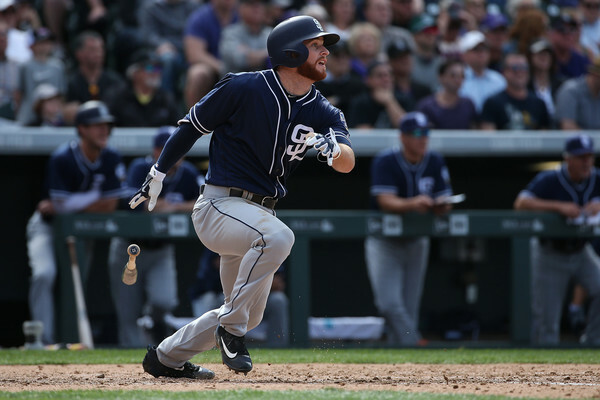 Spangenberg took over as the everyday third baseman once Ryan Schimpf was demoted in the beginning of June. Spangenberg reached a career high in at-bats during 2017 with 444. He also had a career highs in home runs, RBI, doubles, runs, and stolen bases. He hit .264 with 13 homers, 46 RBI, 57 runs, and 11 stolen bases. Cory was never expected to hit for power, but after hitting 13 home runs this year, he is a threat on the base path and for some power. He also expects to hit at a good average in his career. Spangenberg has worked his way into the Padres’ future after a solid 2017 campaign. He posted a 1.4 oWAR in 2017. However, Spangenberg was mediocre defensively, with -14 defensive runs saved and an Ultimate Zone Rating of -5.4. Without his poor defense, Spangenberg could be an A- caliber grade, but factoring in his overall performance, Spangenberg earns a C+ instead. In the minors, 3B Hudson Potts had a stellar 2017 campaign with Low-A Fort Wayne TinCaps. He hit 20 home runs and drove in 69 runs, while hitting .253. He needs to show better plate discipline though, and needs to cut down on striking out after fanning 140 times and walking just 23 times. The beloved Padres’ starting catcher, overall, had a successful 2017 campaign. He hit 18 home runs and drove in 55 runs, despite hitting for just a .214 average. 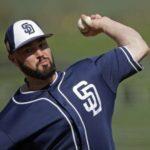 Hedges needs to improve on his average to be the player San Diego wants him to be. Getting on base at just a .262 clip doesn’t cut it. In 2017, Hedges had a 75 wRC+, well below the average player. He also had a K rate of 29.3% compared to his walk rate of only 5.5%. Hedges did show a great hitting approach, hitting the ball to all sides of the field, which is a very good sign going forward. Also, a third of his balls hit in play were classified as a hard hit ball. As a catcher though, defense and ability to call games are arguably more important than his offensive production. 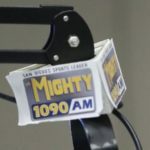 Hedges is praised by the Padres’ pitching staff for his ability behind the dish. Pitchers feel comfortable throwing to Hedges. Defensively, Hedges was very good in 2017. Amazingly, he had just three passed balls over 933.1 innings behind the plate. Putting that into perspective, it’s quite impressive considering eight different catchers had double digits in that category in 2017. Hedges accumulated seven defensive runs saved in 2017. He still does have room to improve in regards to throwing out 36.6% of base stealers. His caught stealing percentage isn’t bad, Hedges was just expected to be one of the best in that regards. 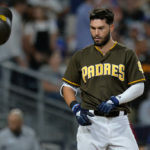 Austin Allen is the only other catcher in the Padres system with potential, who is somewhat close to the big leagues. Solarte had a typical Solarte season in 2017 with the bat. He slashed .255/.314/.730, with 18 home runs and 64 RBI over 466 at-bats. Solarte played all around the infield in 2017, playing first base, second, short, and third. Solarte was a rare hitter in the Padres lineup, who rarely would strike out. He fanned at just a 11.9% rate, while walking at a 7.2% rate. He posted a 1.3 WAR for the 2017 season. Solarte was actually not bad at shortstop, posting a 1.3 UZR at the position across 199 innings. Solarte adds a lot of value as a player because of his ability to play so many different positions. He also adds value being a switch hitter. 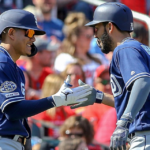 It is unknown whether Solarte will be traded in the offseason, but I know I speak for a large portion of Padres fans when I say I hope he remains with the club. The only drastic change from the opening day lineup was Ryan Schimpf being demoted to Triple A on June 9th, and remaining there for the remainder of the 2017 season. 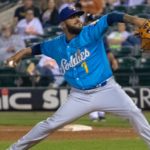 He struggled from the start of the 2017 season, posting just a .158 batting average, and striking out 70 times in 165 at-bats, striking out over a third of his plate appearances. Schimpf still managed to hit 14 home runs in his brief time in the majors. After his demotion, he didn’t fare much better in the hitter-friendly PCL league. He hit just .202, and had an even higher strikeout rate at 37%. 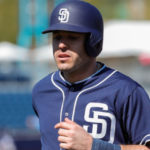 For Schimpf’s struggles after a somewhat breakout 2016 campaign, and his inability to improve at all after his demotion, Schimmpf gets a failing grade.